Therapists are still offering treatments for homosexuality despite there being no evidence that such methods work, research suggests. A significant minority of mental health professionals had agreed to help at least one patient "reduce" their gay or lesbian feelings when asked to do so. Many were acting with the "best of intentions", said the lead author. Only 4% said they would attempt to change a client's sexual orientation, but when asked if they would help curb homosexual feelings some 17% - or one in six - said they had done so. "Of course it's incumbent on a professional to assist a client who wants help, but this should be done using evidence-based therapies - exploring their distress and helping them to adjust to their situation," said Professor Michael King of University College London. "We know now that efforts to change people's sexual orientation result in very little change and can cause immense harm. "We found it very worrying that there was a significant minority who appeared to ignore this - even if they had all the right intentions." The Royal College of Psychiatrists says all homosexuals have "a right to protection from therapies that are potentially damaging, particularly those that purport to change sexual orientation". In the US, where there has been heated debate on the issue of "curing" homosexuality, The American Psychiatric Association (APA) has urged all "ethical practitioners to refrain from attempts to change individuals' sexual orientation". However there are organisations which campaign both for an individual's right to seek treatment and a professional's right to offer it. 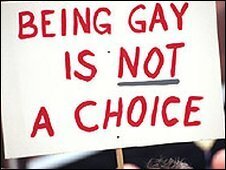 They point to work by Robert Spitzer, a psychiatrist who lobbied for the removal of homosexuality from APA's list of mental illnesses but went on to suggest in a controversial 2001 study that therapy could bring about change in sexual orientation. Researchers in the UK are launching a website to collect stories from around the world about such therapies. They hope in this way to uncover stories from India, South America and China where little is known about the prevalence of such practices. Derek Munn, of the gay rights campaign group Stonewall, said: "The conclusions of this research are a welcome reminder that what lesbian and gay people need is equal treatment by society, not misguided treatment by a minority of health professionals."